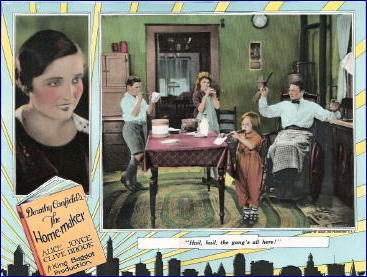 » A Movie Review by Walter Albert: THE HOME MAKER (1925). That same year, King Baggot directed the final, first rate Western of William S. Hart, TUMBLEWEEDS. This is universally hailed as a classic. It can be borrowed easily on DVD from libraries, etc. King Baggot had a huge career in the silents, first as an actor, then as a director. He was one of the first big name male stars. Booze eventually Did Him In. TUMBLEWEEDS is the only King Baggot-directed film I’ve had a chance to see. I’d never heard of THE HOME MAKER. It sounds very interesting. Clive Brook is best known today for starring in two films directed by Josef von Sternberg, UNDERWORLD and SHANGHAI EXPRESS. Much of his other films are rarely revived. Of the actors and actresses in this film, the one other besides Clive Brook whose name I recognize is Julie Bishop, known as Jacqueline Wells back in 1925 (and as she still was up to 1941). She would have been 11 in 1925, so I assume she was one of the children in the family.